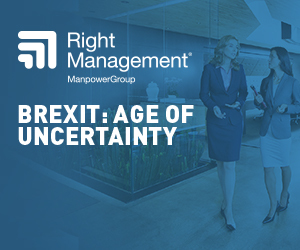 Download our report to view the results, and to learn how your organisation can take people-focussed steps to ensure success as we move towards Brexit and beyond. Right Management is the global career and talent development expert within ManpowerGroup. We help organisations become more agile, attractive and innovative by creating a culture of career management and learning that nurtures future talent, motivates and engages people, and provides individuals with opportunities to increase their value throughout their careers. We improve time to value through our expertise in organisational effectiveness, career management and individual development. Our approach is centered on the fact that organisations thrive when individuals are successful in their careers. We’ve spent the last 35 years identifying workforce challenges and developing innovative solutions, enabling our globally informed methods to be time-tested across more than 50 countries.